When pixels have become out of gamut, how do we put them back in? Some operations result in colours that are out of gamut ("OOG"), that is, some pixels have values outside the range of 0 to 100% of QuantumRange. If we are using integer IM, or saving to an integer file format, then these values will be clamped (or "clipped") to 0 or 100%, and any detail in those pixels is lost, and cannot be reconstructed. We won't even know which pixels were OOG, though we might guess that any values at 0 or 100% were OOG, and we might attempt reconstruction from nearby pixels that are not at the limits. Being out of gamut is not, of itself, a problem. We can continue processing with floating-point. But, eventually, we usually want to bring all the colours within gamut, if only because output devices can't display OOG colors. This page isn't about recovering data that has been lost due to clipping. It is about preventing the loss in the first place. We have shown the range of values in each channel as multiples of QuantumRange, and saved the image to a floating-point miff (which you can download: ob_src.miff). For display on the web, the image has been clamped and converted to JPEG. Notice how the skin-tone at the right-edge bleeds into the white page background. Working in floating-point, we can readily isolate pixels where a channel is more than 100%, and where a channel is less than zero. This proportion of pixels are >100%. This proportion of pixels are <0%. In the first result, most pixels are black. In those positions, pixels have not exceeded 100%. The red pixels are where only the red channel exceeded 100%. 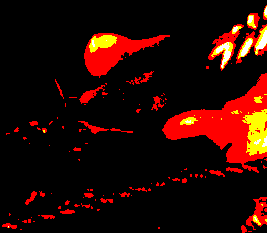 Yellow pixels are where both red and green exceeded 100%. The small number of white pixels are where all three channels exceeded 100%. The second result works in a similar way: it is blue where the blue channel was less than zero, magenta where both red and blue were less zero, and so on. How can we process the floating-point image to bring all pixels into gamut? Instead of clamping, we can "-auto-level". This applies a gain and bias that modifies all pixels, probably reducing contrast, squishing values together so they fit in the range. The same transformation is usually applied to all the channels, though they can be processed separately (but this will create a colour cast). This has retained all the detail in all the pixels. Applying the same transformation to all channels has reduced contrast heavily. Processing the channels separately hasn't reduced contrast as much, but has created a colour cast. Highlights and shadows are processed independently. OOG may occur in highlights, or shadows, or both. This will reduce contrast where the input is less than P0 or more than P1, and will cause hue-shift for RGB pixels that have channels straddling P0 or P1. Setting P0 to 0.0 will clip shadows; setting P1 to 1.0 will clip highlights. Three methods are shown. The first operates on all colour channels (usually red, green and blue), applying the same transformation to each channel. The second operates on all colour channels, applying independent transformations to each channel. The third operates on the L channel of HCLp. The script oogLinear3.bat separates the image, makes three independent calls to oogLinear.bat, and combines the results. "%SRC% -colorspace HCLp -channel B -separate"
Instead of a linear transformation at each end, we can use power curves (sometimes called filmic curves, as they mimic the response of photographic film). These will have slopes of zero at (x0,0) and (x1,1), and one at P0 and P1. So we can calculate B and lnA from a known gradient, at P0 or P1. ... and we will use the equation y = A0*(x-x0)^B0. The gradient of the toe curve is y' = B0*A0*(x-x0)^(B0-1). ... and we will use the equation y = 1 - A1*(x1-x)^B1. The gradient of the shoulder curve is y' = B1*A1*(x1-x)^(B1-1). As for the linear transformation, this method can be applied to all channels together or independently, or just to a lightness channel. Here, we use only one method: all channels together. The script oogPower.bat implements this, using "-fx". See also Filmic Tonemapping with Piecewise Power Curves, John Hable, 2017. Most of the results have differences that are subtle. For comparison purposes, we make a GIF of the results that are similar. Applying the process in sRGB space, whether by a single transformation or three independent transformations, can change hues slightly. Applying the process in HCLp won't change hues. 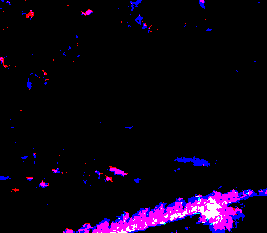 In this example, the linear sRGB transformations darken highlights somewhat. The power method preserves relative brightness very closely. I currently have no conclusion about the "best" method. The process module oogbox is faster, especially for the power curve, and can be incorporated into "convert" or "magick" commands. l number loLimit number Low limit for shadow processing. fmn number forceMin number Force minimum value (override calculation). fmx number forceMax number Force maximum value (override calculation). h number hiLimit number High limit for highlight processing. c integer channel integer Channel number for processing, or -1 for all three channels. The parameters loLimit and hiLimit take the place of P0 and P1 in the description above. To prevent any shadow processing, set loLimit to 0.0 or less. Likewise to prevent any highlight processing, set hiLimit to 1.0 or more. By default, minimum and maximum statistics are taken from all three colour channels, and all three are adjusted. To use the statistics from only one channel, and adjust only that channel, use the channel setting. Hence, to adjust three channels independently, run the module three times with different channel settings. The module calculates the minimum and maximum values. To override these, use forceMin and/or forceMax. For method power, values outside the range will not be changed. For method linear, values outside the range will be changed, but not far enough to bring them inside the box. As expected, the differences are virtually zero, which confirms the process module has the same effect as the scripts. The process module is also useful when converting camera raw files into colorspaces. See Squishing xyY into shape. When an image is encoded HCLp, and we convert to sRGB, is the sRGB image guaranteed to be in gamut? No. Hence, if we use HCLp to try and bring an sRGB OOG back into gamut, we should then test the sRGB result and apply a suitable process to that. 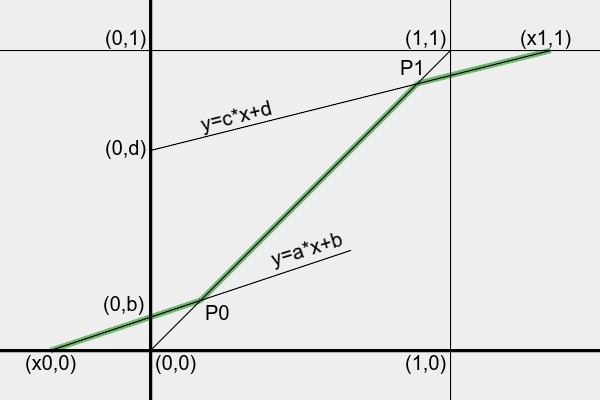 Instead of linear transformations y=a*x+b etc, we could use spline curves, (eg from P1 in the direction of (1,1), to x1 from the direction of (1,1)), or cubic curves. Currently P0 and P1 are parameters from the user, defaulting to 0.0 and 0.9. Perhaps sensible values could be calculated somehow. @rem makes output %2 with all values within 0 to 100%. @rem %3 limit for lower transformation. @rem %4 limit for upper transformation. :: FIXME: if X0 > -epsilon, don't calc a and b.
:: FIXME: if X1 < 1+epsilon, don't calc c and d.
@rem Applies oogLinear independently to three channels. @rem %5 colorspace that contains a lightness channel (eg Lab, HCL). @rem %6 number of lightness channel (0, 1 or 2). :: Only do each end if OOG. Source file for this web page is oogbox.h1. To re-create this web page, execute "procH1 oogbox".